✔Unique and modern, this rope Ceiling Lamp will be a great addition to your living area. 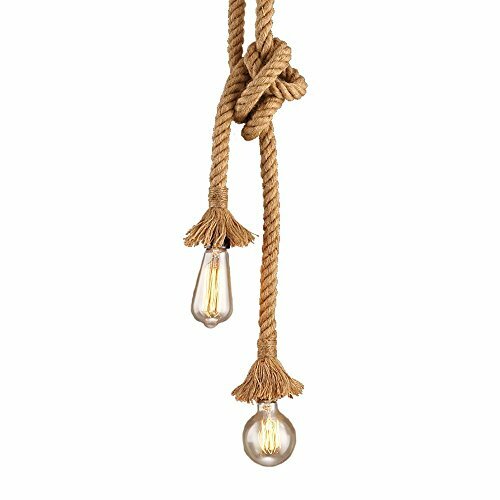 1.✔High Qualit: Made of hemp rope, the pendant light looks very special and vintage.You can tie various creative and unique knots as your preference. 2.✔Wire length:The lenth of the rope is 100cm/39.37" (Approx. ).Recommended bulb power: 40w.Voltage: AC90-220V.E26/E27 lamp base, you can choose any bulbs with E26/E27 interface as you want. (No bulbs provided). 4.✔Easy to Install:Standard E27/E26 screw base.Chain is adjustable.Changing the length of the chain according to your preferences and design. 5.✔Perfect to create warm, romantic atmosphere for your restaurants, bars and cafes. If you have any questions about this product by CTKcom, contact us by completing and submitting the form below. If you are looking for a specif part number, please include it with your message.